In January 2018, Rogers Stirk Harbour + Partners (RSHP) and Aedas unveiled their involvement in a boundary crossing which will provide a new entry point into Hong Kong. 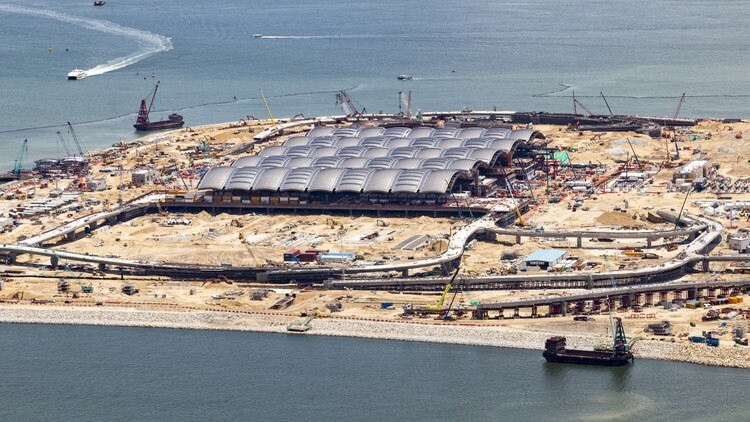 The Hong Kong-Zhuhai-Macao Bridge - Hong Kong Boundary Crossing Facilities (HKBCF) is a joint project between the two architects, working with AECOM, which will provide new connections between Hong Kong, mainland China, and Macao, and bring wider benefits across the Pearl River Delta. The HKBCF will cover 130-hectares on a new 150-hectare artificial island reclaimed from the open waters to the north-east of Hong Kong International Airport (HKIA), and will benefit from proximity to HKIA’s transport links, including the SkyPier Ferry Terminal, and the MTR’s Airport Express and Tung Chung line. The HKBCF will be constantly filled with movement; buses arriving and leaving, and cars and lorries waiting to be processed. Careful thought has therefore been given to how users will move around the site. Simple, clear circulation through the facility is reinforced by the waveform roof, enhancing legibility and providing wayfinding. The movement through the building is punctuated with full height canyons allowing the penetration of natural daylight to all levels of the building and ensuring there is a visual connection to the linear roof form to further reinforce clarity of wayfinding. The elegant modular roof form lends itself to offsite pre-fabrication and has enabled an efficient construction process achieving a very high level of quality. The project will be environmentally friendly, aiming to meet the highest standards for new developments and utilise innovative green technologies. This article was originally published here on 16 Jan 2018 by RSHP.